1988 Dino-Riders Struthiomimus action figure WITH FEATHERS. IN 1988. Size: 20cm of feathered glory. Scale: Scales on the feet, feathers up top. Also, 1:12. Sculpted by: The wokest of all 1980s dinosaur toy sculptors. Produced by: Tyco (obviously with a lot of help from Bob Bakker). No need to adjust your TV sets folks, this is a mass-produced dinosaur toy made in 1988 that is covered in feathers. Not like lame, Primal Carnage, Jurassic Park 3, cool-guy dragon with a mohawk. Natural looking feathers. This is why Dino-Riders was the best thing about the '80s (sorry, He-Man). 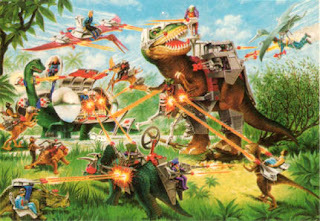 Dino-Riders gave us aliens from the future riding armored mind-controlled dinosaurs blasting a thousand lasers at other armored dinosaurs who were not mind controlled but who were just in it because they cared about justice, and the toy versions of these things looked more naturalistic and scientifically accurate (for the time) than anything in Jurassic World. I'm going to use this particular review to drop some history. Your bill's looking a little puny, there, buddy. (Painting by Heinrich Harder, 1912, public domain). Everybody knows Pteranodon. Quick, stop to imagine it! It's easy, because it's the most often-illustrated and well known pterosaur to the general public (though today's marketing departments often call it a pterodactyl, following it's original, century-out-of-date classification). But hold on. That image you have in your head right now, of a big pterosaur with a long crest and a mid-length pointy beak? That's likely wrong, and may be just as much a hybrid as those Flintstones-style creatures with pteranodont crests and Rhamphorhynchus tails. How do we know? Let's talk about Dawndraco. Pterodactylus antiquus has a special place in history as one of the first ever prehistoric reptiles to be subjected to scientific study. It's one of the best known pterosaurs, with many complete specimens known to science, and it ended up lending its name to the entire group of pterosaurs to which it belongs (Pterodactyloidea). In fact, "pterodactyl" has become a common nickname for all pterosaurs, thanks in part to the fact that nearly all pterosaurs were considered species of Pterodactylus during the 19th century. Despite the importance of pterodactyls, very few toy versions of them have been produced (in fact I don't know of any other than this one and one made by Starlux - if you know of more, let me know in the comments!). Sure, there are lots and lots (and LOTS) of toys out there claiming to be "pterodactyls", but the vast majority of these are actually other species of pterosaur, most often Pteranodon. A lot of older "pterodactyl" toys from the 1950s - 1980s are weird hybrids of the Pterosaurs' Greatest Hits, like pteranodonts with teeth, or with Rhamphorhynchus tails. But almost none of them are the classic, the original, the one and only pterodactyl. That's probably not a coincidence or a mistake - like the "velociraptors" in Jurassic Park that were really Deinonychus, pterodactyls have a cool name attached to a somewhat wimpy animal. 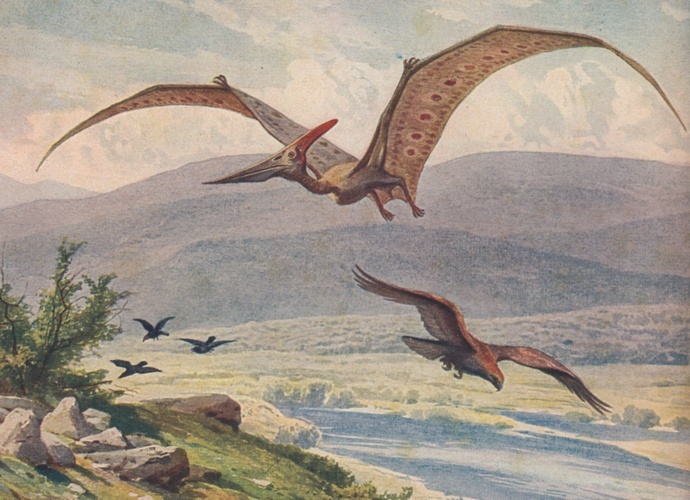 Most pterodactyl fossils are tiny, with wingspans of only a few feet. Larger specimens do exist, but these skin-winged critters don't seem to have grown any bigger than a large seagull. Personally, I think that's part of their charm - I can't help but picture flocks of them squabbling over dead squids any time I watch gulls at the beach. But in terms of raw awesomeness, they certainly can't compete with 20 foot beasts like Pteranodon. © Pan Aves 2013. Awesome Inc. theme. Powered by Blogger.